Amolik Group is known for its construction quality and ideal floor plans. Their latest offering Amolik Heights Flats in Faridabad in sector 88 of Greater Faridabad is a HUDA Approved housing project. The floor plans of this residential project are rightly suitable for today’s Indian families with more carpet area and less loading space. Apart from the floor plan this residential property amolik heights flats in Faridabad offers facilities of international standards such as 24/7 security and water supply, power backup in common areas, separate children park, shopping complex, separate walking and jogging tracks, rain water harvesting etc. If we talk about the connectivity, India Gate is just 24 km away from Amolik Heights Apartments in Faridabad while Delhi Badarpur flyover is just 13 km away. 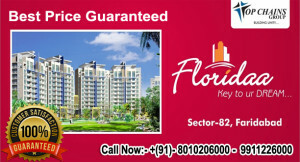 It offers 1 BHK, 2 BHK and 3 BHK flats at a very realistic price. All these features and facilities make Amolik Heights Apartments the ultimate place to live a peaceful life in Faridabad. Situated in the centre of Greater Faridabad, sector 86 residential property Adore Happy Homes has become the first preference of home buyers in the Neharpar area due to its faultless design and construction standards. 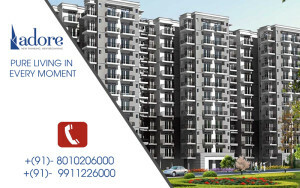 Adore Happy Home Flats in Faridabad offers 2 BHK flats at a very reasonable price starting from 19.50 lacs. Equipped with all basic and modern facilities like parks, jogging tracks, maintenance staff, security etc this lavish looking project enjoys the connectivity advantage too as developed sector 14 and 17 are in close proximity. Schools, Hospitals, Banks, ATM’s and Markets are situated near to this residential project. Adore Happy Homes Flats in Faridabad provide world class specifications like washable colour on walls, tiles ceramic and IPS flooring, window and door frames are according to IS Code. Structure frame of RCC are also designed according to latest IS Code and NBC Recommendations. Approved and supervised by Haryana Urban Development Authority, Adore Happy Homes is the most trusted name in Greater Faridabad.